The Voltaire Street storefront of People's Food Store, circa 1972. Questing, contrary, willful, inventive, questioning women. We are women who name ourselves and announce ourselves as the oracles we are. Breaking the mirror of deceit that kept us tamed, framed, within the mirror, the cage. Unbound in this world, free to achieve our hearts desires. I am reminded of such women by Laughing Womyn’s (Whispers of Our Knowings by Laughing Womyn Ashonosheni) words on First Woman. How many of these women can you honestly remember meeting in your lifetime? How many such women do you know now in OB? I have the good fortune of knowing one such woman personally. Come along with me to visit with her as she shines her light on her experiences in OB in the late 60’s/early 70’s. Moonbeam’s (her real name is Jeanne, but in the true spirit of the late 60’s, and taking a creative liberty here, she suggests we use Moonbeam throughout the article ) warm hospitality is only surpassed by her illumination of her multi-generational history in OB. She offers me a freshly made cup of coffee (damn good one at that!) and we settle into her warm, welcoming kitchen for what would turn out to be a rich and enjoyable conversation. Her family ~ from grandparents to grandchildren ~ has lived in Southern California for five generations now. Her beginnings in OB started in 1968. As a legalized adult teenager, she married and rented a small house on Brighton (a steep $60 bucks a month back then) to begin her new family’s life. Humble beginnings for three in this one bedroom house to be certain, yet one significant enough to have changed OB forever. 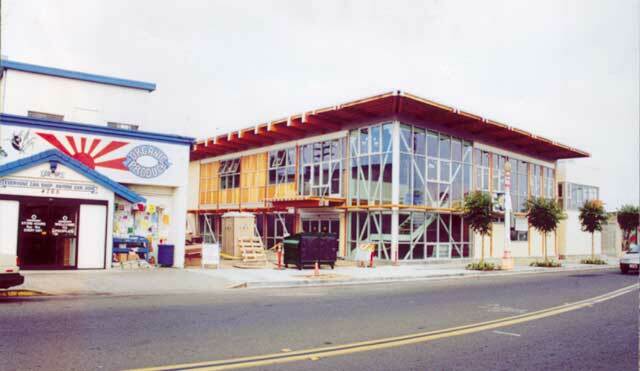 People’s Food Store (left) next to construction of OB People’s Co-op (right). Sept 2002. Moonbeam heard her inner call to action and did something about it. Through word-of-mouth research she found sources of “healthy foods at real cheap prices.” She would drive out to local San Diego farms, pick up fresh dairy, grains, beans, flours, nuts, and honey, and bring it back to OB in her old VW Bus (complete with antler horns bolted the front of it). A handful of volunteers would bag and distribute it to those in need from her house in the 4900 block of Brighton. A new choice for all was born. OBceans now had a choice to keep shopping at either of the corporately-owned supermarkets in town or obtain fresh, healthy, organic, affordable food at another venue. It was a peaceful solution to real people’s needs. Even after Moonbeam moved to a farm where she raised vegetables, goats, chickens, geese, and rabbits for a few years, she continued to bring fresh homegrown vegetables to the People’s Food for trade. I can just imagine this strong, empowered, 70’s, now single mom with 2 year old daughter-in-tow, loading up her pieced together 1960 Volvo with fresh farm goods and a plethora of homegrown produce, driving three times a week on her own dime from Campo to OB, all while attending SDSU. Sounds like a strong, center woman who lives and breathes compassion in action in its highest form! In Moonbeam’s years on the farm, more and more people shopped and bartered at People’s. A second generation of volunteers rose up to keep People’s Food Store alive and well. Under this second wave of volunteers a new location, a house on Voltaire, was rented to provide additional space. Rent and utilities were paid by the monies collected at the non-profit store. Not one single volunteer collected a paycheck. Profit from food was still considered “corporate greed attaching itself to a basic human need.” Natural, harmonious progression during these years saw the birth of order sheets, classified ads regarding food pick-up dates/times in the OB Rag (OBRag archives: Vol 1, No 17, July 71; Vol 2, No 8, March 72), free membership, even a free box where people could exchange clothes. Once again, women, remember the wisdom of those who came before you. Women like Moonbeam who have stood up and bucked the status quo throughout history to provide for their families and community. Moonbeam enhanced the lives of all OBceans with her willingness and ability to help her community. Her significant, donated efforts revolutionized the way things were. Because of her gifts of time and energy, along with others who volunteered in the beginning, OBceans had access to healthy, affordable, organic foods outside the corporate establishment. 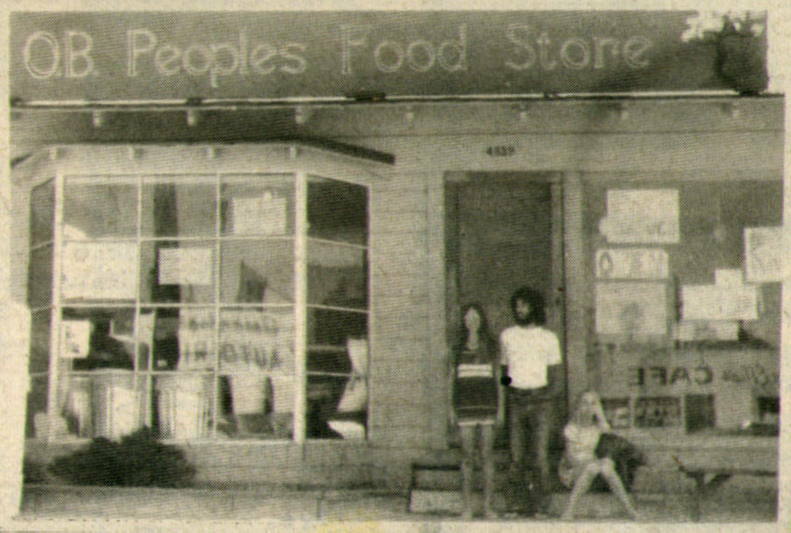 As a third generation of volunteers took over, People’s Food Store turned into what is now known as the OB’s People’s Food Co-op. Yep, the very one standing at Voltaire and Sunset Cliffs today. But, that’s another story in itself and I mustn’t digress. That’s heavy, man. Her questions make me wonder about my own life in OB. What community need(s) do I see or hear about? Am I doing anything to help? I must continue to ask myself these types of questions, less I turn a blind eye to my fellows and this caring, community spirit vanishes forever due to my inability to take action. Thank you, Moonbeam, for reminding me why I chose OB as my home in the first place. Family, community, self, those who came before us, those who to follow: we are all connected. Thank you, Laughing Womyn and Moonbeam, for helping us remember who and what we truly are and what we are fully able to do. I believe that collectively we can continue to make revolutionary differences in OB. Moonbeam and others did it in the 60’s/70’s. Countless sage women before them have done it in their respective communities. Willing to join me, fellow OBceans, in keeping our community one where those in need are still offered a hand up, not a hand out? My eyes are open and my fingers ready on the keys. Tell the OBRag what needs you are aware of in OB (and to our readers outside OB…what needs do you see in your community?). Excellent! It seems to often these days that the generation coming up has forgotten the hard won battles we fought for equality. Remembering those women is a good reminder of what we did and continue to do for people everywhere. Thanks Sunshine for showing us the way. Great piece filled with sunshine that lights up a hopeful past wherein women shine as they always have. Having been raised by a strong loving free thinking community minded single mom and then living with and raising children with one who possessed the same attributes, I appreciate stories that highlight just what women contribute to our world. that is certainly a perfect way to convey the intersection of love and action that led to what is now the co-op. Amazing and well written. Your moonbeam lights up all of our days! Was that place on the 4900 block of Brighton what used to be known as “Veggie House”? Didn’t the Sandalmaker and his family also live on the 4900 block of Brighton? As for OB needs…I think we need a better way to pool, buy, sell, or barter used books. Amazon has made it easy to buy used books, but that book has a new carbon footprint and needs new cardboard every time there’s an ownersip change. Great article. I grew up in your area and so appreciate the insights, movement, and freedom of powerful women. We are everywhere! You might check out Laughing Womyn’s Radiant Wisdom Tarot and newly published other books via Amazon etc. Whispers of Our Knowings was and is a treasure. Older Article: Is the deluge over?